SOUTH KINGSTOWN – University of Rhode Island chemistry professor Mindy Levine looks to boost girls’ interest in science for the seventh year in a row with her Chemistry Camp for middle school girls. Though this year’s camp is full, with 40 girls, a wait list is accepting names of interested parties for next year. The free camp will be held during school vacation week, April 15-19, at the URI Multicultural Student Services Center on the Kingston campus. According to a news release, Levine began the camp in response to statistics showing girls losing interest in science during middle school, with women earning about 57% of all bachelor’s degrees and just over half of all science and engineering bachelor’s degrees but still being underrepresented in science, technology, engineering and mathematics professions. Levine also runs a Sugar Science Day for high school girls, also at URI, each February. 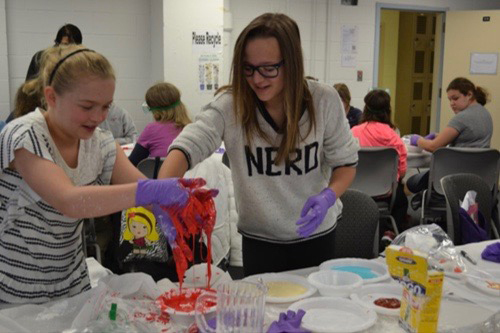 Funded through Pfizer community grants, Chemistry Camp includes guest scientists, inter-active experiments and field trips to Mystic Aquarium and the Providence water-treatment plant owned by the Narragansett Bay Commission.